It's been awhile since I posted anything on my web-page. Summer is in full swing and I am enjoying being outside as much as I can accept when it is 95 + degrees. I've been working on a writing project that needed my attention for awhile. My veggies in the garden are growing faster than the weeds. We are enjoying eating the zucchini and the cucumbers are ready to be eaten as well. I picked a green pepper today for the tossed salad. This year I thought I try some lettuce. I planted King Head lettuce. It looked like it was growing rather nicely and started to form heads. Then a strange thing happen. It just kept growing straight up. The lettuce grew to over two feet tall. It looked like little “Cone Head” people from another plant. I decided to harvest one or two and I tasted it and —it was bitter beyond bitter. The wild rabbits had a nice dinner treat. I am creating a new line of lettuce-Cone Head lettuce—just have to figure out how to make it sweet and not bitter. The tomatoes are growing so delightfully. I can hardly wait when they start to ripen. I am planning to can lots of salsa and stewed tomatoes while savoring each bite of fresh grown tomatoes. Watching God's veggies grow are one of my favorite things in the summer. The other is watching our two apple trees magically produce apples. We had the apple trees pruned last fall. This year the trees didn't produce a lot of apples but we usually have more than enough to provide apples for Helena and the deer population. I can applesauce. I make applesauce muffins. I usually have a applesauce muffin for breakfast with my coffee. Yummy good! My only frustration this summer has been trying to get rid of the mice in our cupboards. We haven't had mice in the house for a long time and then suddenly the little critters decided to move into our cupboard area in the kitchen. You have to know that spiders, bees, ants and bugs don't bother me. However mice give me chills up and down my spine. I think I have had two many experiences with mice over the years. I think I am suffering from PTSD over mice—they just put me into another orbit someplace. I became obsessed in getting rid of the mice. I placed lots of traps—no avail. These mice either went to college because they are very smart or they are very street wise. I decided to see if I could block any openings that the little darlings are getting in at. My husband purchased some foam spray that fills in any cracks and openings to stop the rodents from entering. I was confident that this new weapon of defense would get rid of them. I removed all my cupboard drawers and immediately proceeded to spray the openings I found. However I quickly realized that I should of read the directions because this foam spray sticks to anything it lands on and quickly drys where it lands. The directions said: wear rubber gloves, protect your head and eyes. Opps! My husband came into the kitchen and said: “Why didn't you wait for me? He just walked away shaking his head in disbelieve. How can an obsessed mice terminator wait or read anything? I had a mess. I had made a big mess on my hands, arms, and hair. The only word I could think of was: “Connie, you are such a Knucklehead.” Well, I spent the rest of the day trying to get the caked on foam stuff off my hands. It took 24 hours of scrubbing, soaking and literally picking off the dried foam. My hands have recovered with applying lots of vitamin E lotion. I would like to report that the mice problem was resolved with the rodent foam spray.---nope! Still have the little darlings. The good news is I am learning to be patient. I am putting out four traps per night. This morning my husband announced that one mouse was caught. I said good. Please remove it from my sight. I'm not touching it or looking at it. Lessons learned: “Read the Directions” before proceeding into any new territory. Ask for help-my husband for one and pray to St. Joseph and St. Francis. That's my knucklehead story. 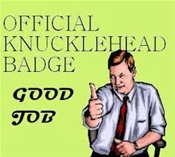 I was awarded the official knucklehead badge award.